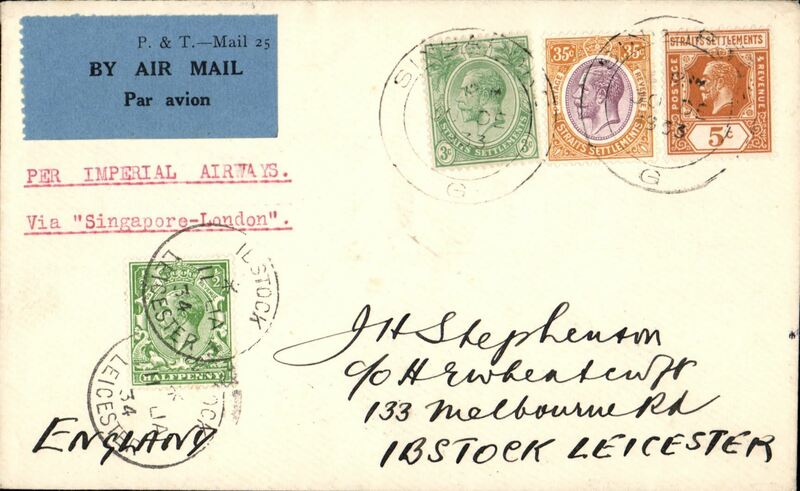 Scarce first acceptance of mail for acceleration from Far East to Great Britain by Air Union Marseilles-Paris-London serviceMarseille-London service, Muar to London, registered London EC 3/11 arrival ds on front, via Singapore 10/10 and Penang 12/10, franked Johore 3c,6c and 12c x2 stamps, registered (hs) cover canc Muar cds, black three line "First Service from Malacca/Connecting with Marseilles/London Air Mail" cachet verso, STS-A-1 airmail etiquette rated rare by Mair, Francis Field authentication hs verso. 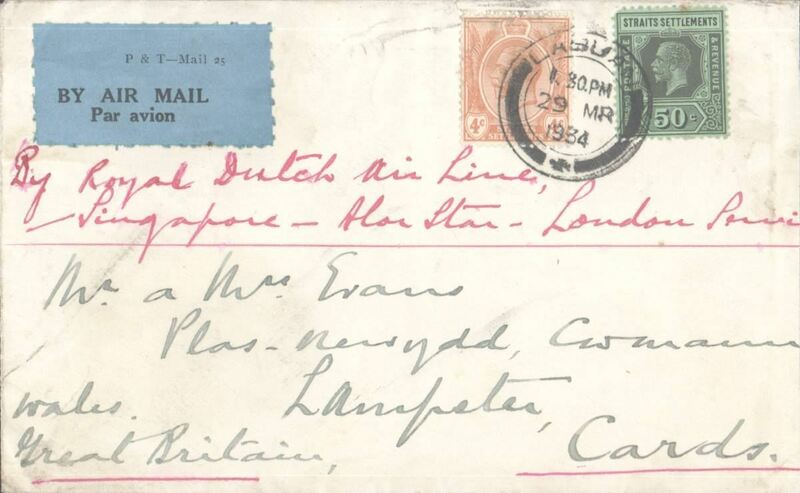 Johore acceptance for carriage on the KLM Java to Holland accelerated service connecting with the Marseilles-London service enabling 1 day acceleration, Muar to London, bs fine strike red London 30 dec 28 receiver, registered (hs) cover franked 31c, canc Muar 3 Dec 1928 cds, via Jahore 4/12 and Penang 7/12, ms 'Marseilles-London', believed only 12 flown. Francis Field authentication hs verso. 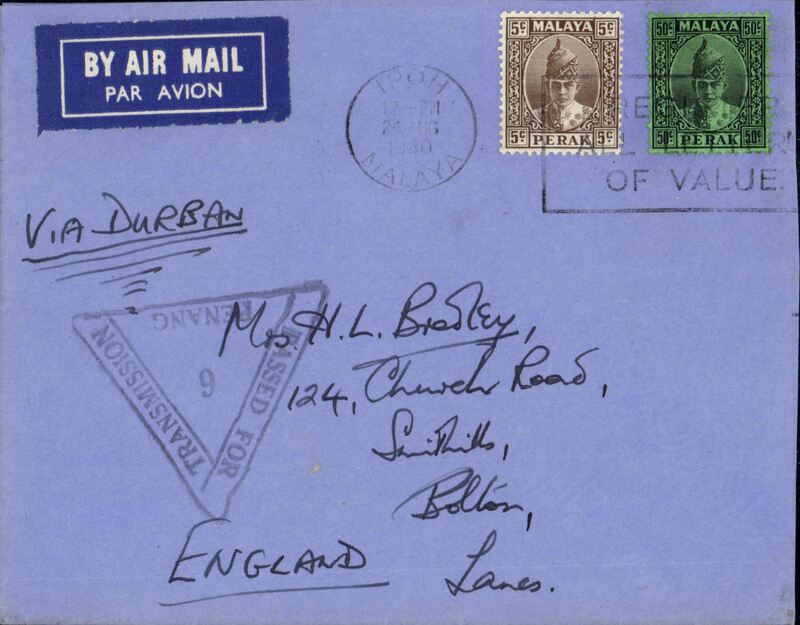 Malayan Airmails, an 18 page article on Malayan Airmails 1923-63 , NC Baldwin. Collector's photocopy. 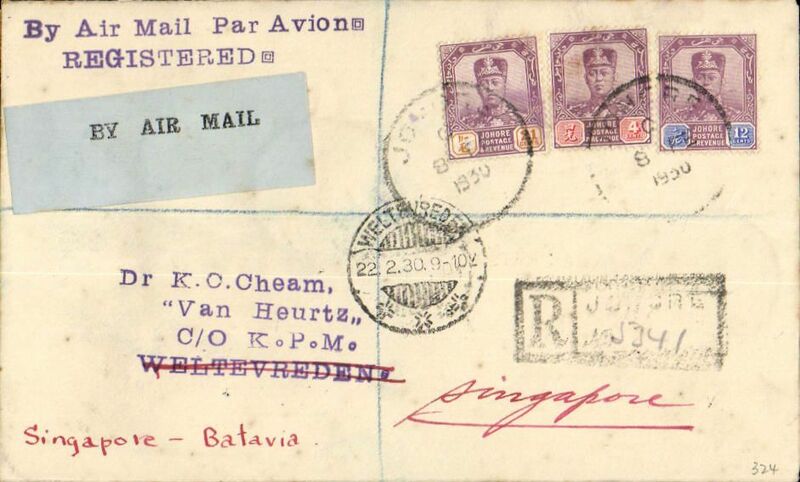 Acceptance of mail from Johore for Weltevredin, bs 11/2, via Singapore 9/2, for carriage on the KNILM experimental Singapore-Palembang-Batavia flight, registered (label) cover franked 4c,12c and 24c Johore stamps, canc Johore 8 Feb 1930 cds, pale /black 'By Air Mail' etiquette P&T Mail 25. 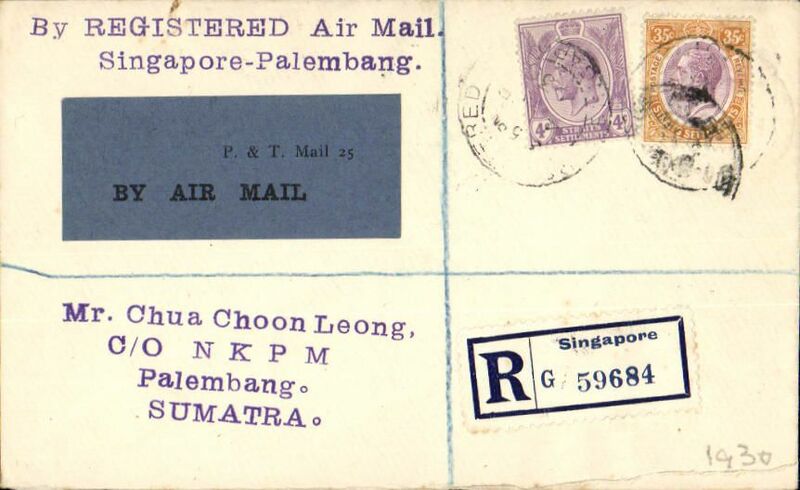 Acceptance of mail from Johore for Palembang, Weltevredin, bs 5/3, via Singapore 1/3, for carriage on the first regular KNILM Singapore-Palembang-Batavia service, registered (label) cover franked 12c, 25c Johore stamps, pale /black 'By Air Mail' etiquette. 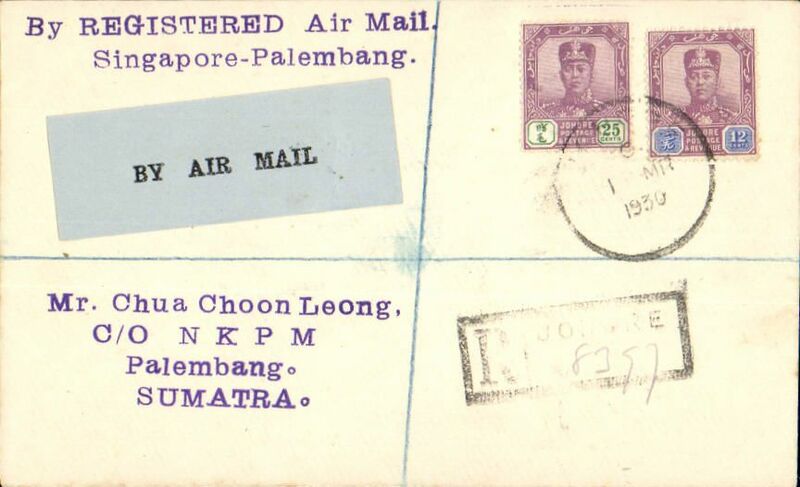 KNILM F/F Singapore to Palembang, Sumatra, bs 5/3, registered (label) cover franked 39c Straits Settlements stamps, scarce grey blue/black P&T Mail 25 Air Mail etiquette. 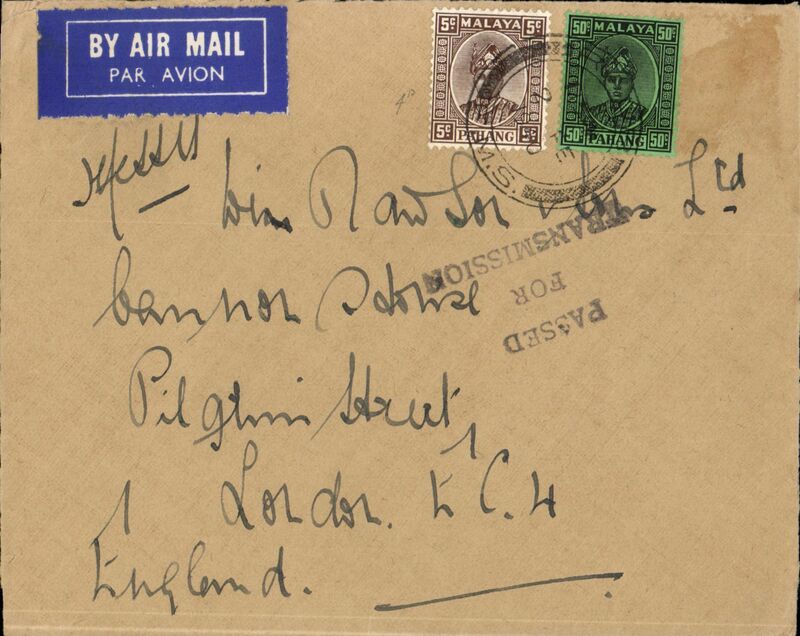 Malayan Airmails, an 18 page article on Malayan Airmails 1923-63 , NC Baldwin. Collector's photocopy. 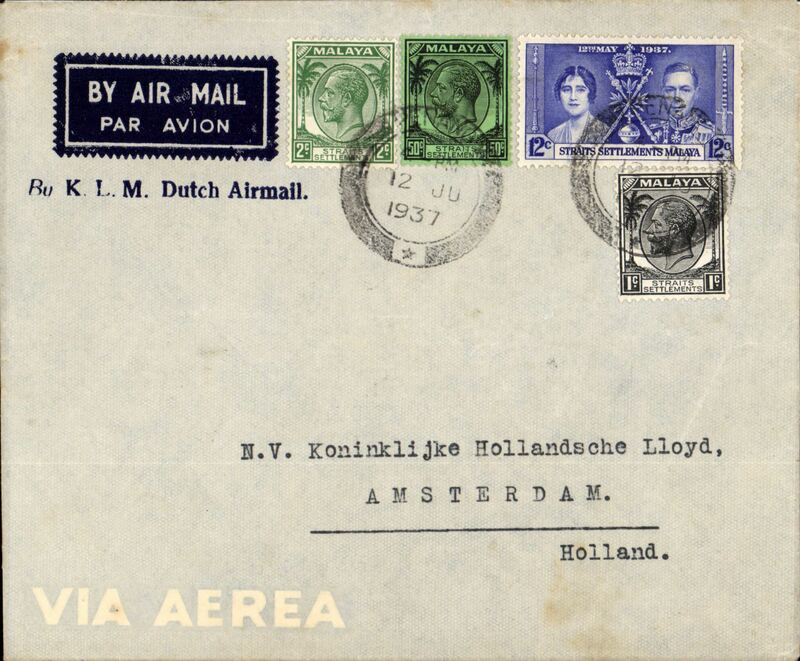 First acceptance of mail from Malaya for carriage on the KLM inaugural Medan to Amsterdam sevice, Medan to London, bs Liverpool 27/10, carried on buff cover franked 56c Federated States Malaya stamps, canc Kuala Lumpur cds, typed 'By Air Mail/Medan-Amsterdam', scarce blue grey/black PTG 479/28 airmail etiquette. 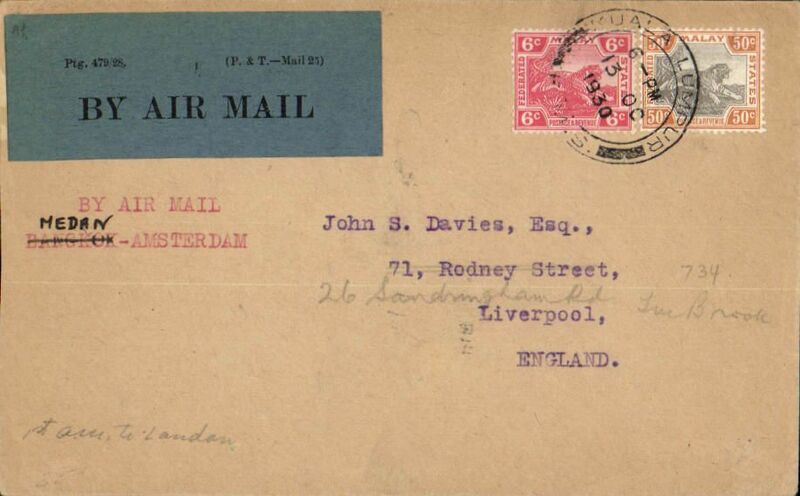 Malayan Airmails, an 18 page article on Malayan Airmails 1923-63 , NC Baldwin. Collector's photocopy. 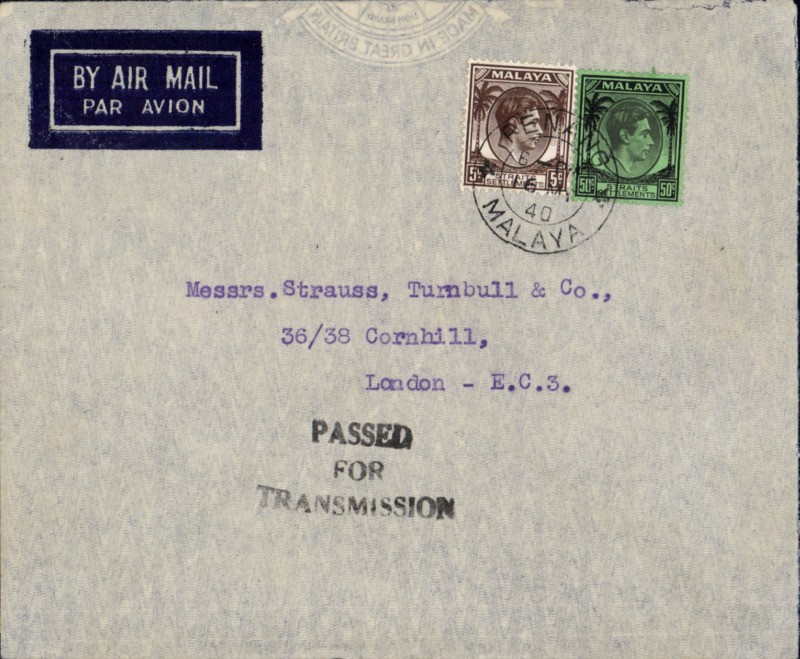 Malaya to England, souvenir pale grey/blue souvenir cover "First/Imperial Airways/Malaya-Englnd/Air Mail Service/31st December, 1933"', franked 53c Malay Federated States stamps canc Kuala Lumpur cds. Scarce cover. 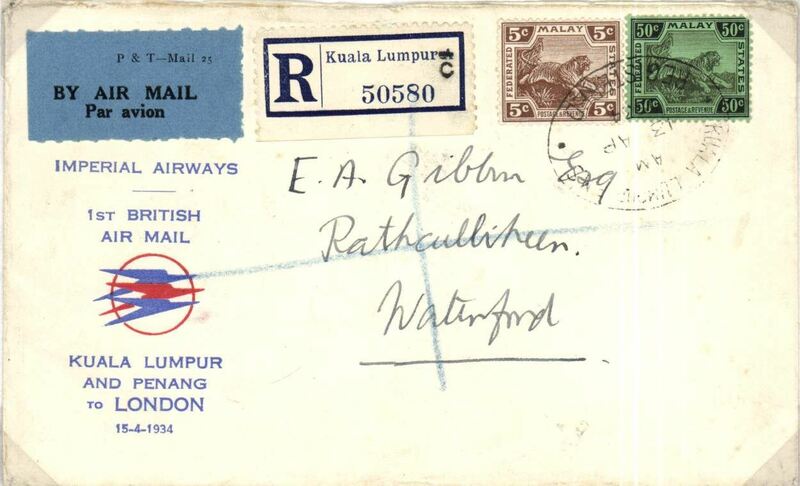 Imperial Airways/ITCA new accelerated schedule via Kuala Lumpur and Penang, F/F Kuala Lumpur to London, Imperial Airways Arrival Terminus 24 Apr 1934 receiver, red/blue/white souvenir cover with small circular red/blue speedbirds logo and printed "Imperial Airways/1st British Air Mail/Kuala Lumpur and Penang/ to London/15-4-34", franked 40c canc Kuala Lumpur reg oval 14 Ap 34 ds. 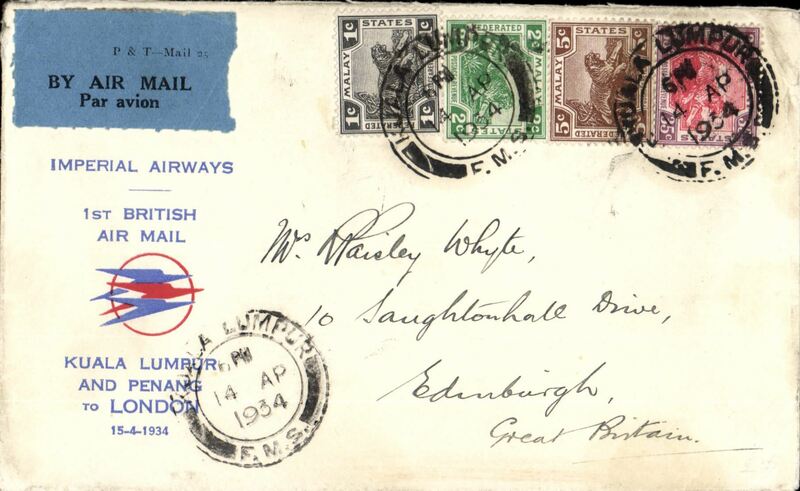 Imperial Airways, Kuala Lumpur to London via Penang, F/F new accelerated timetable, flight IW 263, scarce 'Speedbird' souvenir cover printed 'Kula Lumpur /and Penang /to London', franked Malay 40c - the first inclusive air mail rate in lieu of air fee and surface rate. Flight interrupted at Kuala Lumpur, see Wingent, p116. 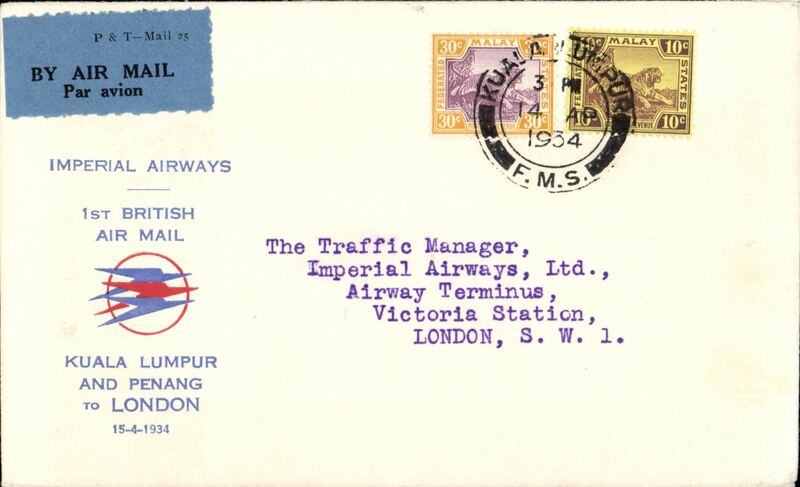 Imperial Airways, Penang to London, F/F new accelerated timetable, flight IW 263, scarce 'Speedbird' souvenir cover printed 'Kula Lumpur /and Penang /to London', franked Straits Settlementts 40c - the first inclusive air mail rate in lieu of air fee and surface rate. See Wingent, p116. 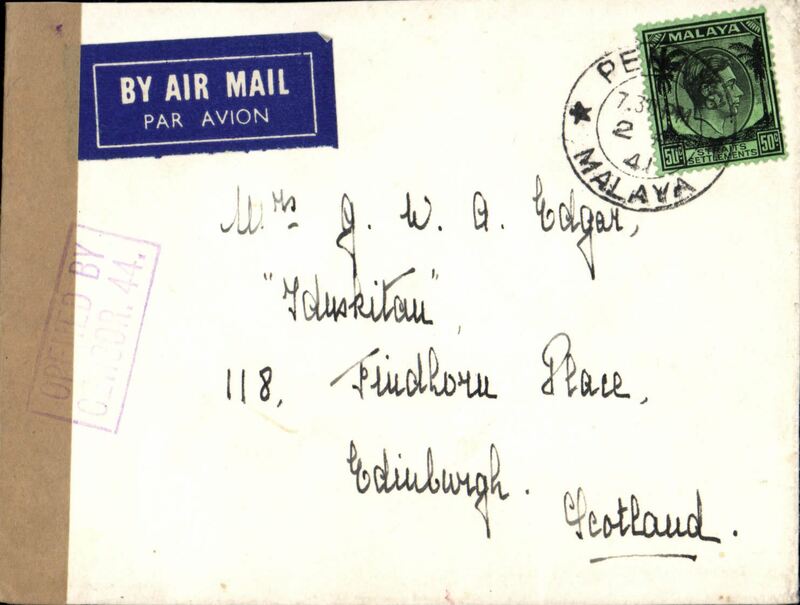 Imperial Airways, Kuala Lumpur to London via Penang, F/F new accelerated timetable, flight IW 263, scarce 'Speedbird' souvenir cover printed 'Kuala Lumpur /and Penang /to London', franked Malay 40c - the first inclusive air mail rate in lieu of air fee and surface rate. See Wingent, p116. 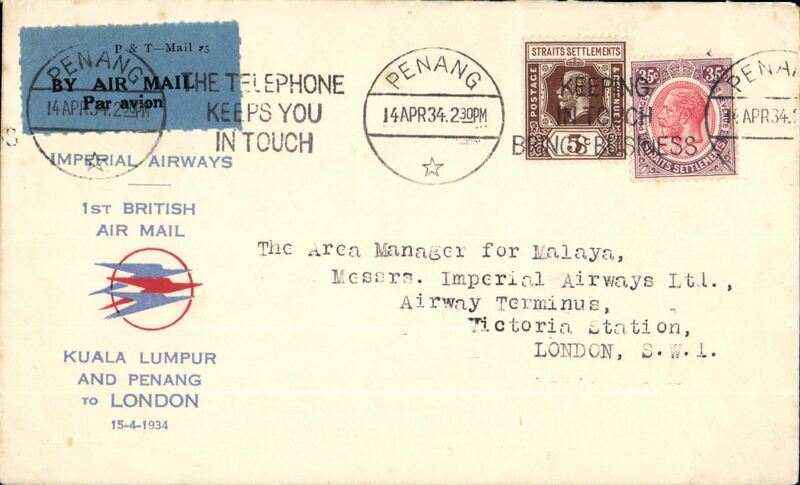 Imperial Airways/ITCA new accelerated schedule via Kuala Lumpur and Penang, F/F Penang to London, Imperial Airways Arrival Terminus 24 Apr 1934 receiver, red/blue/white souvenir cover with small circular red/blue speedbird logo and printed "Imperial Airways/1st British Air Mail/Kuala Lumpur and Penang/ to London/15-4-34", franked 40c canc postmarked Penang machine cancel 14 Apr 1934. 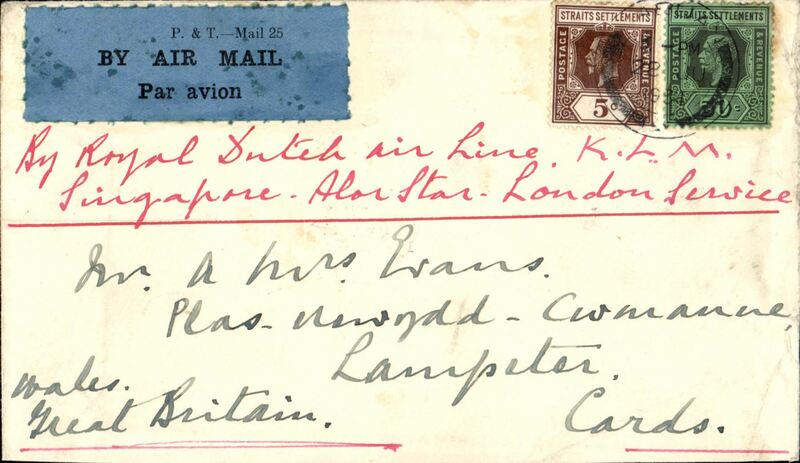 Imperial Airways/ITCA new accelerated schedule via Kuala Lumpur and Penang, F/F Kuala Lumpur to London, no arrival ds, registered (label) red/blue/white souvenir cover with small circular red/blue speedbirds logo and printed "Imperial Airways/1st British Air Mail/Kuala Lumpur and Penang/ to London/15-4-34", franked 55c canc Kuala Lumpur reg oval 13 Ap 34 ds. 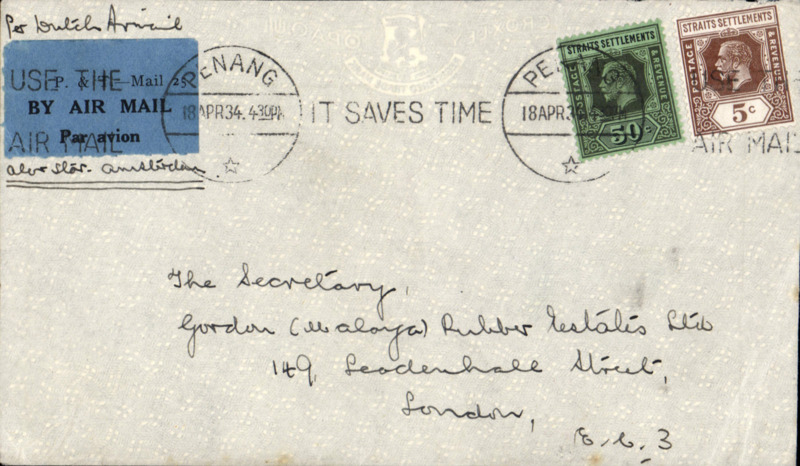 Penang to London, commercial cover franked 55c, ms 'Per Dutch Airmail/Alor Star - Amsterdam' tied by green blue/black airmail etiquette. 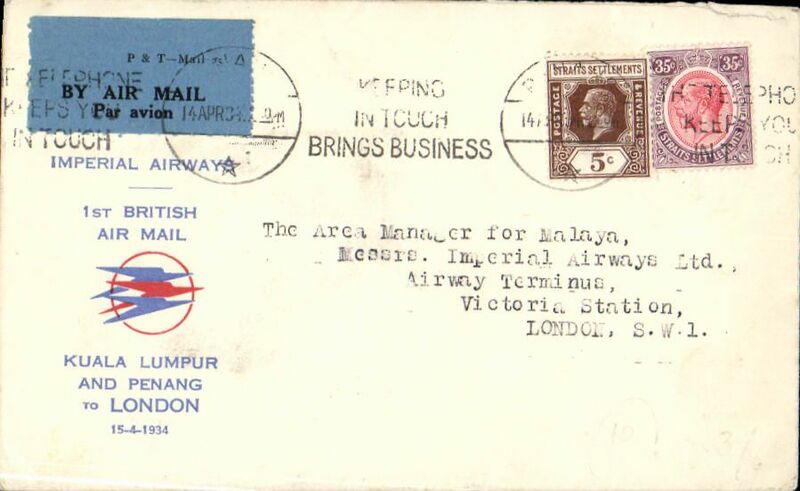 Imperial Airways Far Eastern Service, Sitiawan, Perak to USA, no arrival ds, commercial corner cover franked Malay FS 35c and 12c, dark blue/white airmail etiquette cancelled red double bar Juqu'a applied in London, ms 'By Imperial Air mail/Alor Star-London', carried on IAW IW293. Flow to London, then sea to USA. Uncommon origin. 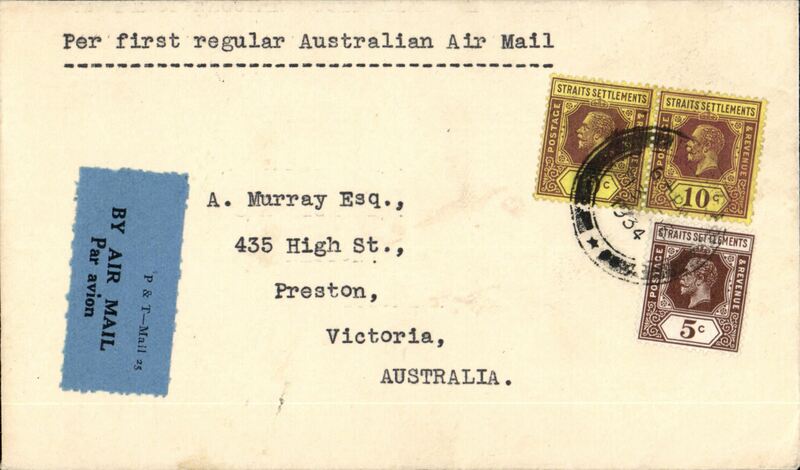 Imperial Airways/Qantas, F/F Penang to Melbourne, bs 22/12, carried on first regular weekly service UK-Australia, plain cover correctly franked Straits Settlements 25c canc Singapore cds, blue/black 'P&T Mail 25', airmail etiquette. 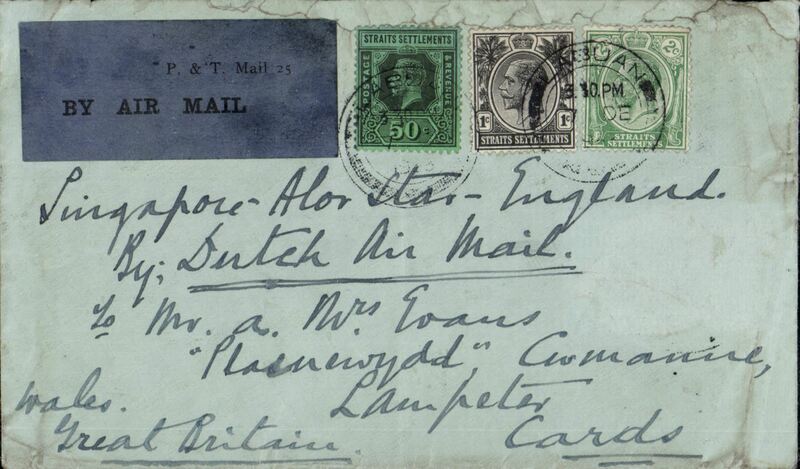 Penang to London correctly rated 60c for KLM 1/2oz rate, franked 60c, canc Penang cds, uncommon and attractive dark blue/white 'By Dutch Airmail/K.L.M.' etiquette. 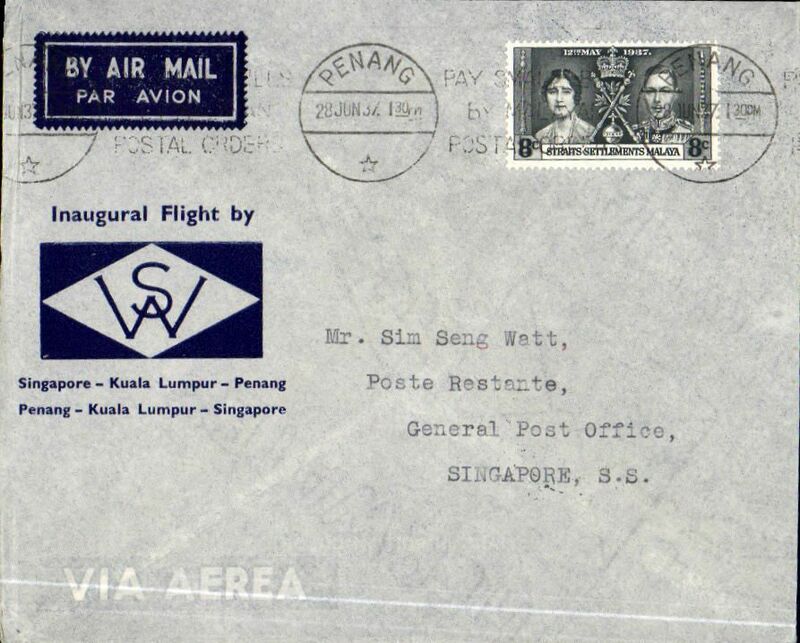 F/F Penang to Singapore, blue/cream souvenir cover with framed head and shoulders picture in lower lh corner of HM King George VI with 'Crowned/12th May 1937' text , also blue printed 'First Flight/Penanag-Singapore/Internal Malayan/Airmail Service'. The cover is both attractive and uncommon. See scan. 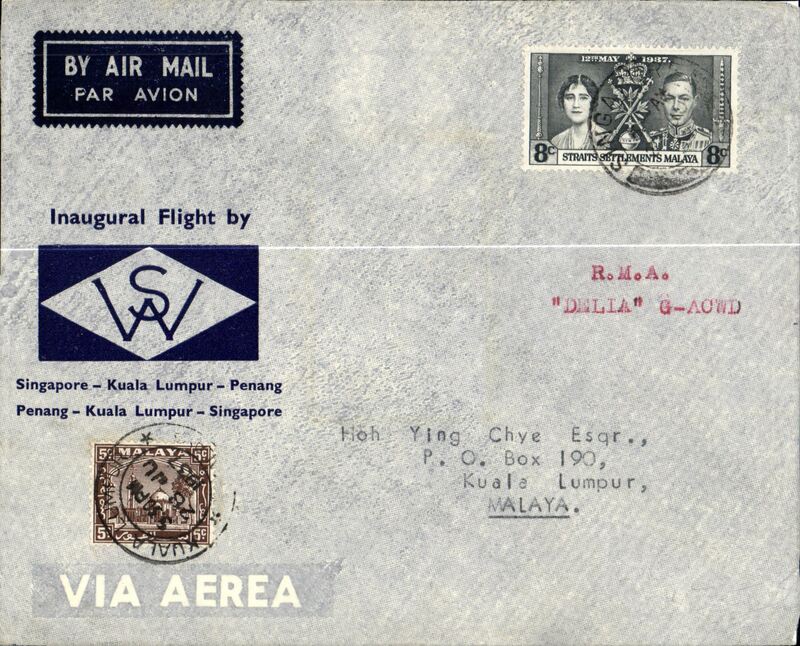 First internal airmail, Penang to Kuala Lumpur, official grey/blue company cover franked 8c, ms 'R.M.A./Delia G-ACWD', Wearne's Air Services. 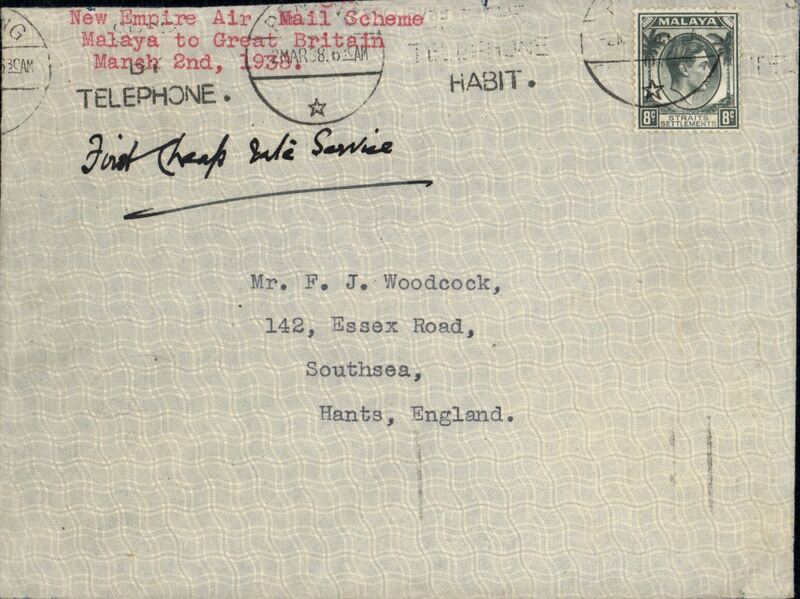 First internal airmail, Kuala Lumpur to Singapore, bs 1/7, official dark blue/grey souvenir cover franked 8c Coronation, Wearne's Air Services. 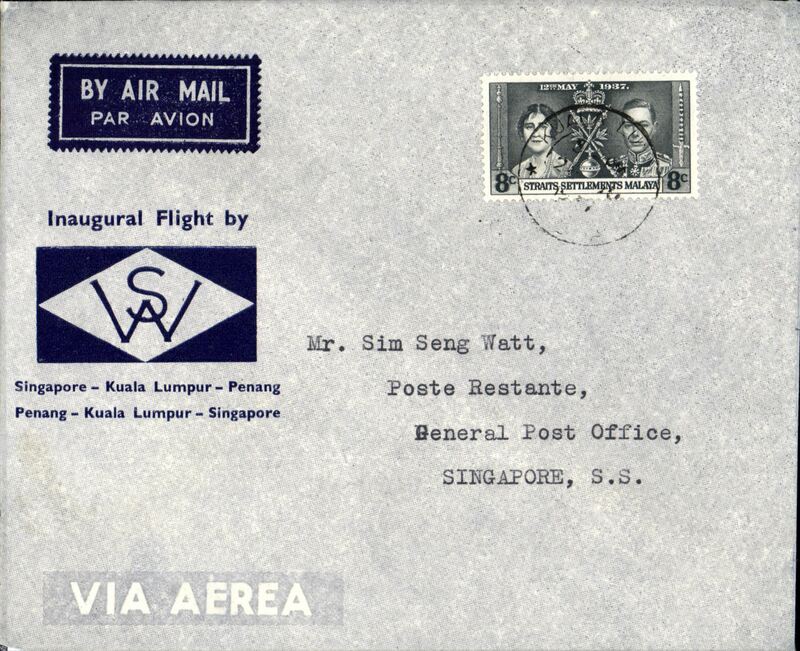 Wearne's Air Services, first internal airmail, Penang to Kuala Lumpur, bs 28/6, printed blue/grey souvenir company cover franked Straits Settlementts Coronation 8c, canc Singapore cds. Scarcer leg. 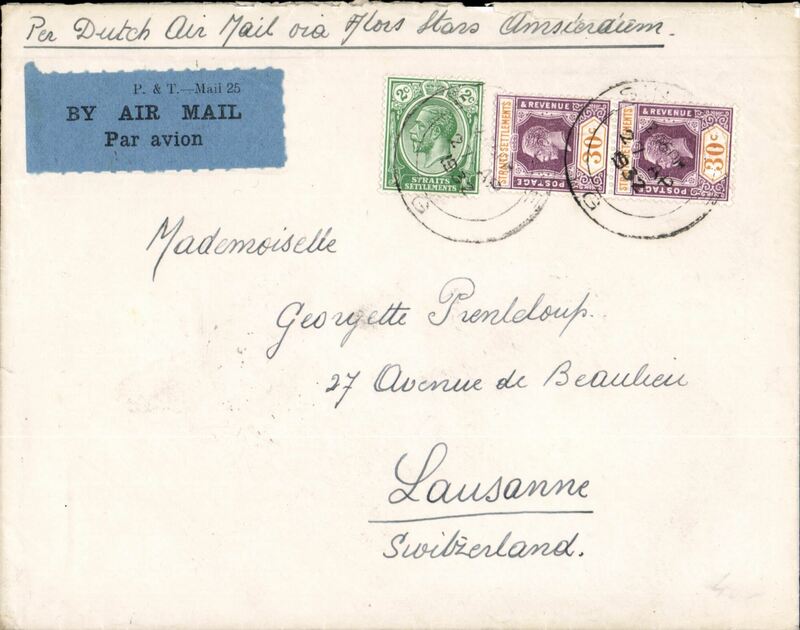 Penang to London by KLM (Dutch) airline, commercial airmail etiquette cover franked 60c inclusive rate, Straits Settlements 30c x2, canc Penang cds. 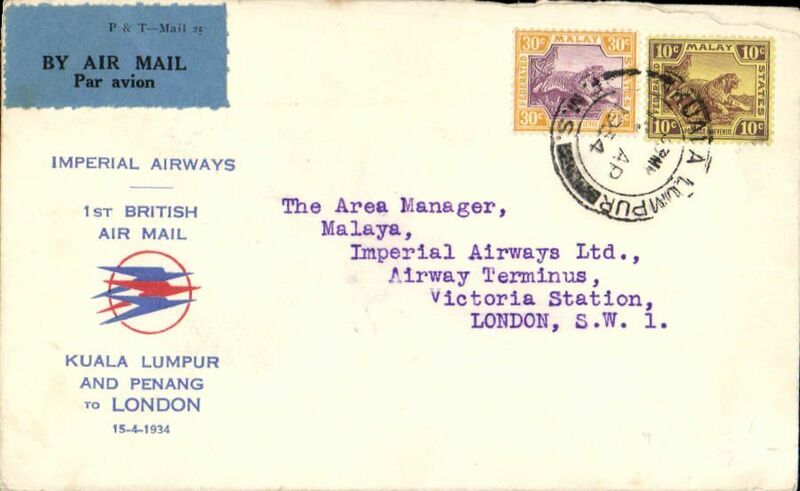 New Empire Air Mail Scheme, first return flight Penang to England, plain cover correctly rated 8c, ms 'First Cheap Rate Service', EAMS propaganda hs verso. 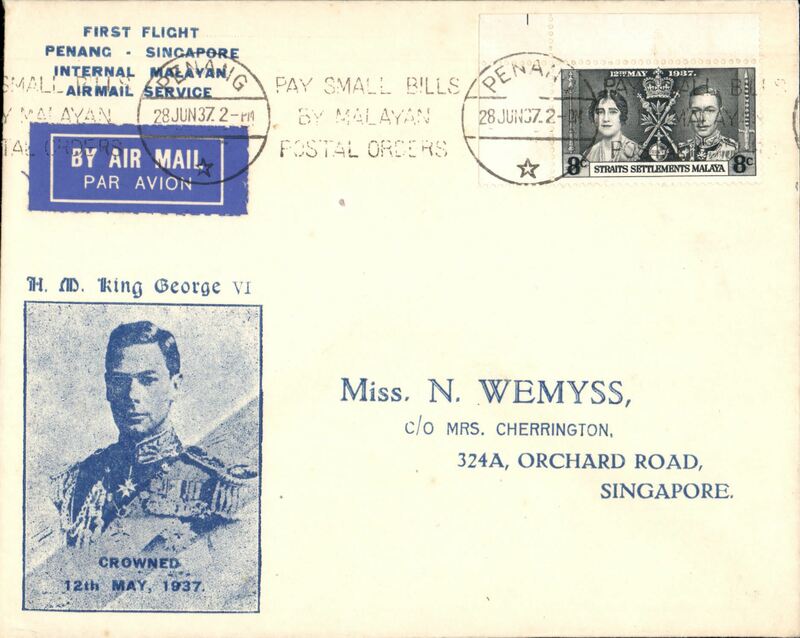 First return flight New Empire Air Mail Scheme, Penang to England, plain cover correctly rated 8c, ms 'First Cheap Rate Service', EAMS propaganda hs verso. 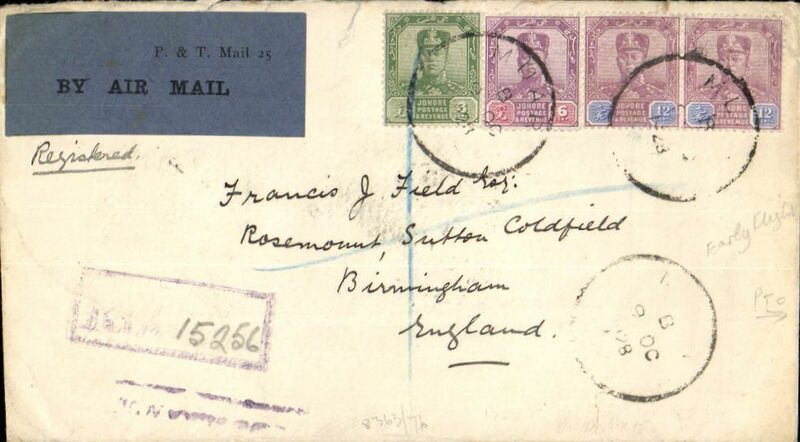 WWII airmail cover to England, no arrival ds, franked 55c, black three line "Passed/For/Transmission" censor mark, verso uncommon 1c Malaya Patriotic Fund "He Will Thank You" vignette. 55c is the correct rate for carriage by BOAC to London. 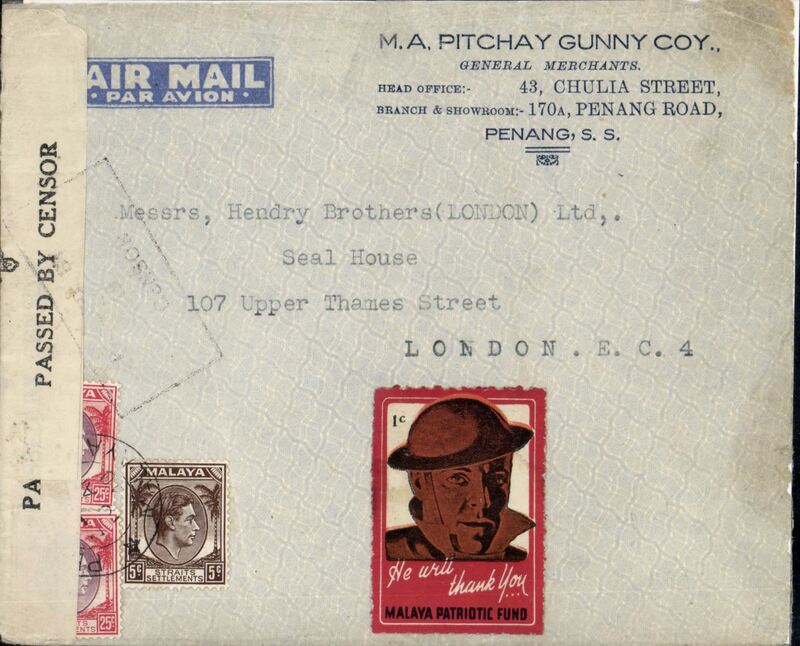 WWII censored cover, Penang to London, imprint airmail etiquette commercial corner cover correctly rated 55c for postage on the BOAC Penang-London service from Sep 39 to May 41, canc double ring Penang 10 Apr 40 cds, sealed B&W Singapore censor label tied by framed Singapore censor mark, red/brown/white '1c Malaya Patriotic Fund' label. 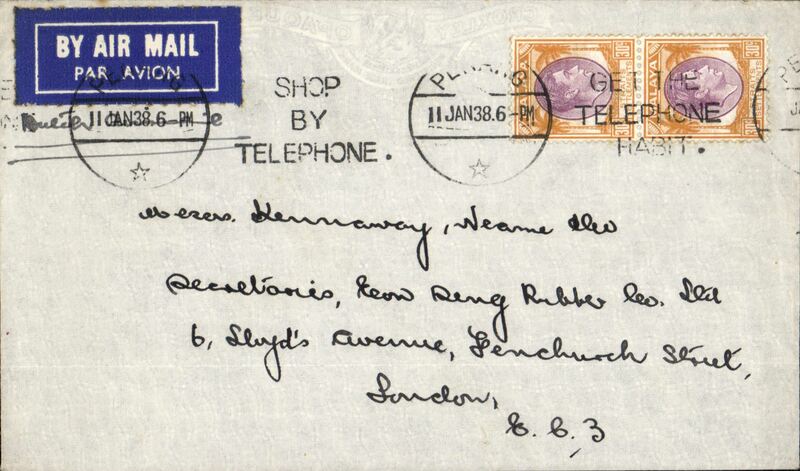 WWII censored cover, Singapore to UK, plain cover correctly rated 55c for postage on the BOAC Singapore-London service from Sep 39 to May 41, Singapore cds, red straight line 'By Air Mail' hs, black 'Passed For Transmission Singapore 14' triangular censor mark. 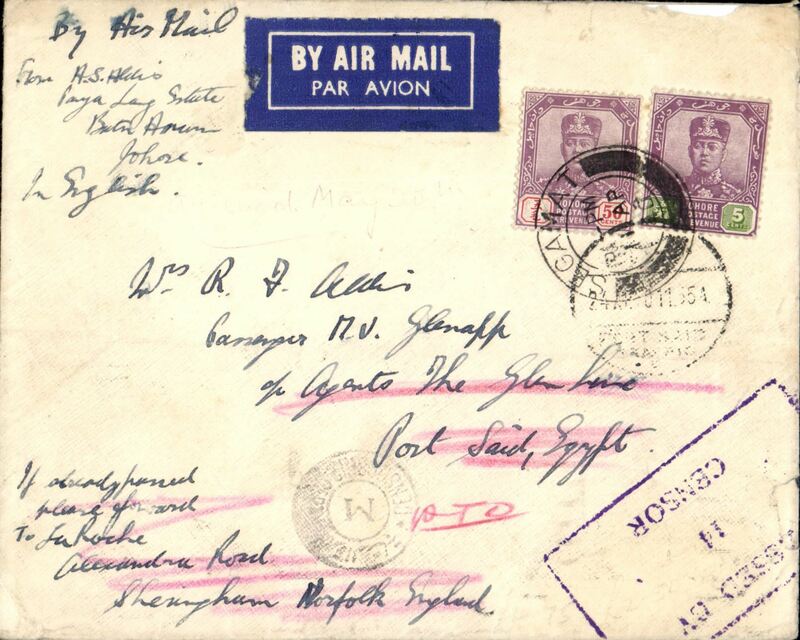 Johore-Cairo-London, early WW II censored airmail to passenger aboard ship, franked 55c Johore stamps canc Segamat cds, correctly rated 55c for BOAC Singapore-Cairo service 5/9/39-8/5/41 addressed to MV Glenapp, Shipping Agents, Port Said, bs 20/4, via Cairo 19/4, Egyptian censor mark, then re-directed to London 18/5. 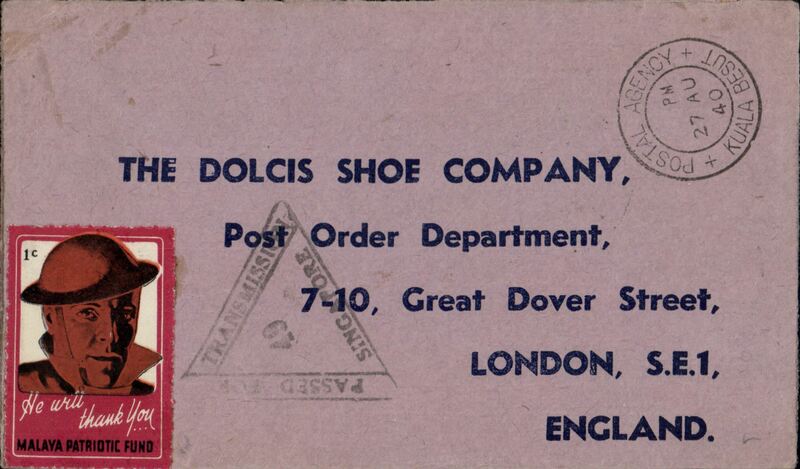 Violet boxed Singapore "PassedBy/14/Censor". The ship was a Glen Line vessel which survived the war. Ironed horizontal crease and top edge damage, mostly verso. 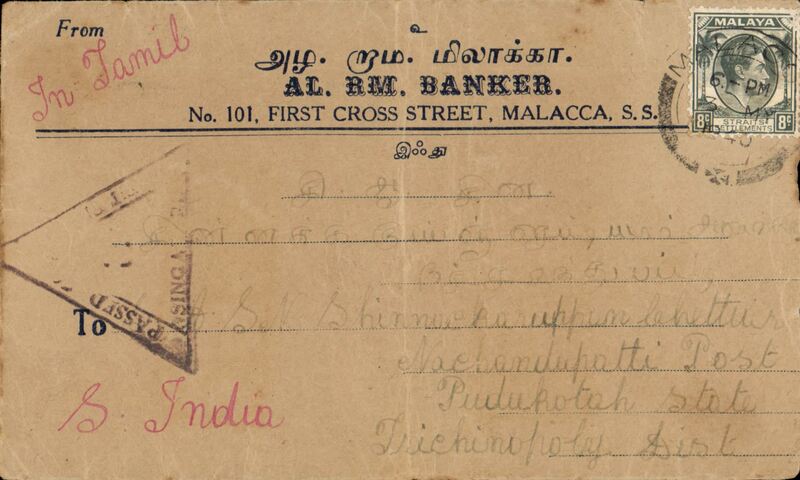 NOT FLOWN, WWII censored commercial cover, Malacca to Trichinopoly, S. India, correctly rated 8c for surface transport, violet 'Passed /By Censor/Singapore' censor mark, and verso red/brown/white undenominated 'Malaya Patriotic Fund' label with horizontal crease. 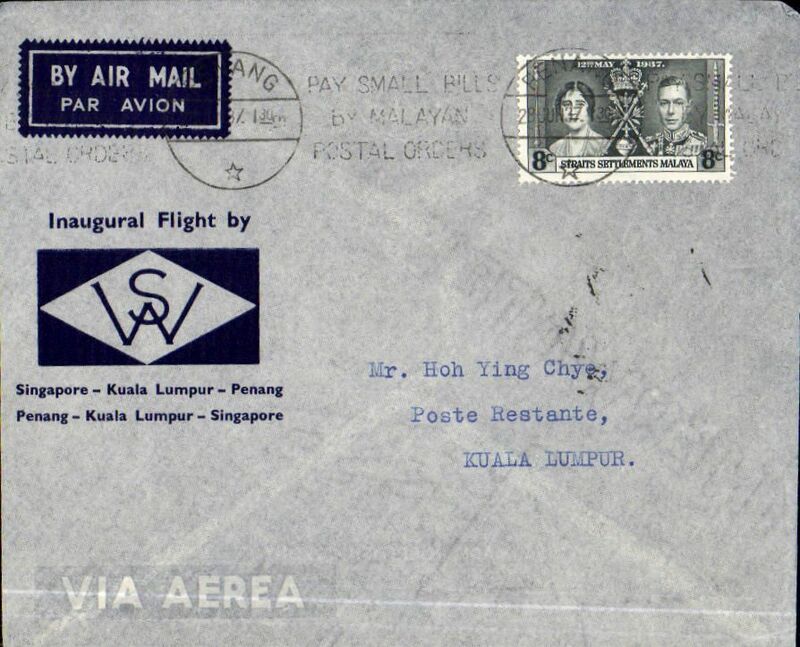 Last BOAC flight before transfer of the direct Singapore-Cairo-Southampton route to the Singapore-Cairo-Durban-Southampton (Horseshoe) route, WWII censored cover, Ipoh & Penang to England, airmail etiquette cover correctly rated 55c canc 'Ipoh/Malaya cds', black 'Passed For Tranmission Penang 6' censor mark. 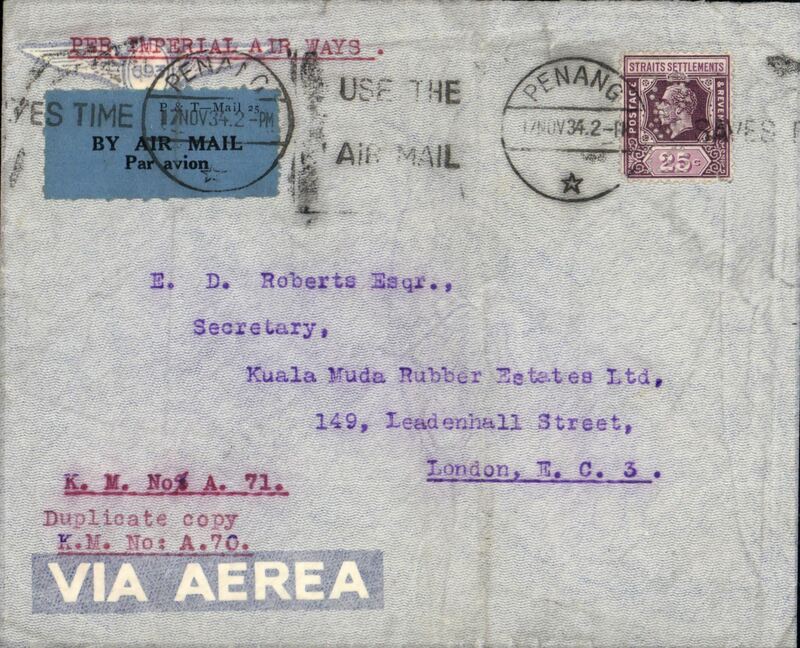 NOT FLOWN, WWII censored commercial cover, Postal Agency, Kuala Besut to London, franked 10c Trenganu stamps verso canc Postal Agency, Kuala Besut cds, also Besut 28.8, cds, correctly rated 10c for surface transport, red/brown/white 1c 'Malaya Patriotic Fund' label, and black 'Passed /By Censor/Singapore 49' censor mark. 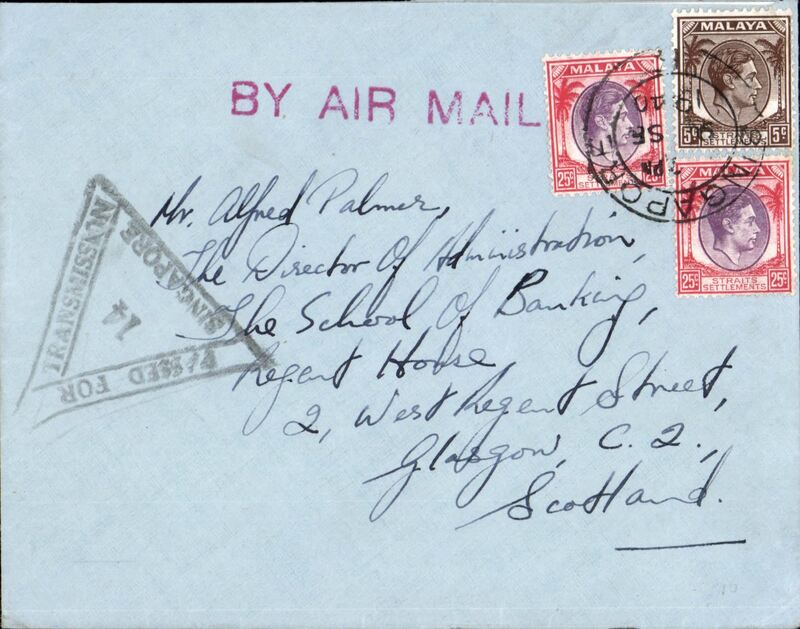 WWII censored airmail, Penang to Scotland, plain cover franked 50c, canc Penang/Malaya cds, sealed plain brown tape tied violet framed 'Opened By/Censor 44' front and verso. Correctly rated for carriage over the Horseshoe route from May 1941 to Feb 1942. 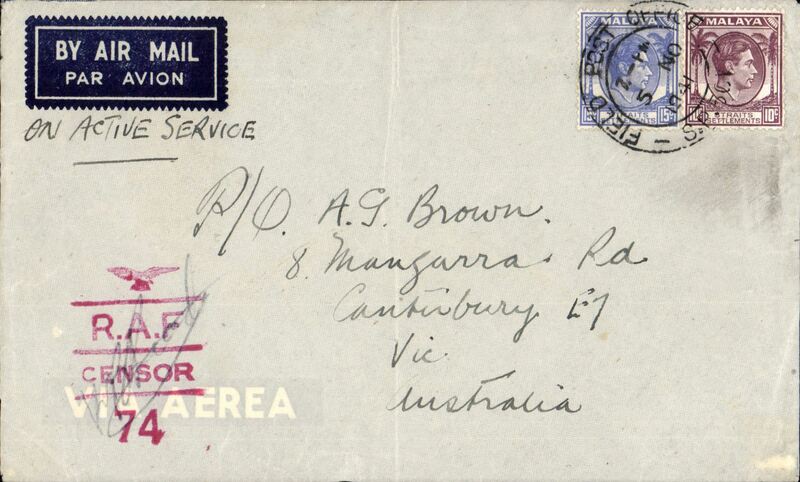 Australian Imperial Forces mail, Serembam, Negeri Sembilan to NSW, Australia, censored WWII ‘YMCA’ printed corner cover, franked red ‘Postage Paid/ 25 cents/ Johore’ double ring hs (shortage of stamps so Postage Paid hs used instead) tied buy Australian Imperial Force ‘A.I.F. 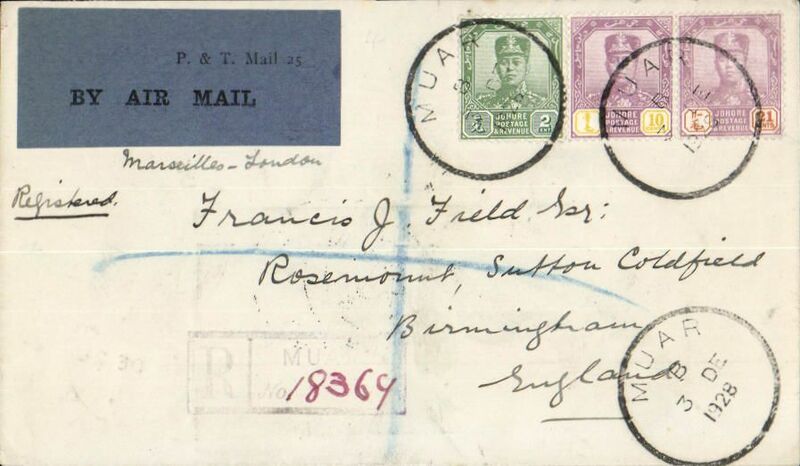 Field PO/ 150041/ No17’ (based in Serenbam at that time), fine strike violet triangular Unit sensor No 3413, also violet straight line ’By Air Mail’ hs. 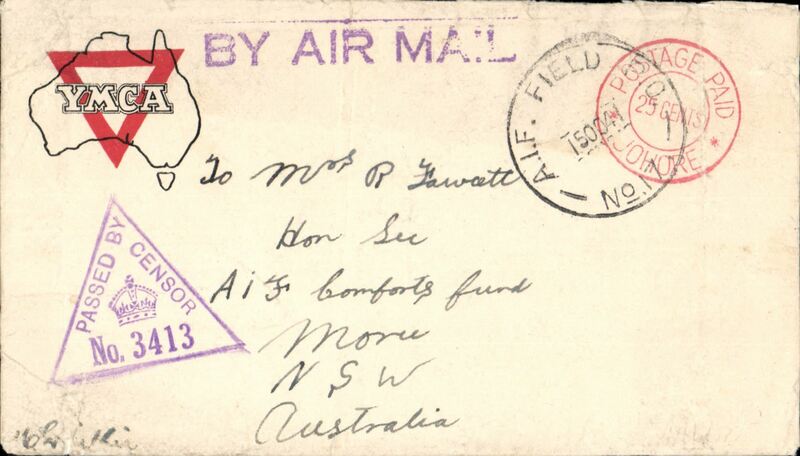 Active Service airmail, WWII RAF censored cover, postmarked 'FPO/SP 501/5 No 1941' to Australia, airmail etiquette cover franked 25c, red eagle over R.A.F./Censor/74 censor mark, ms 'On Active Service'. 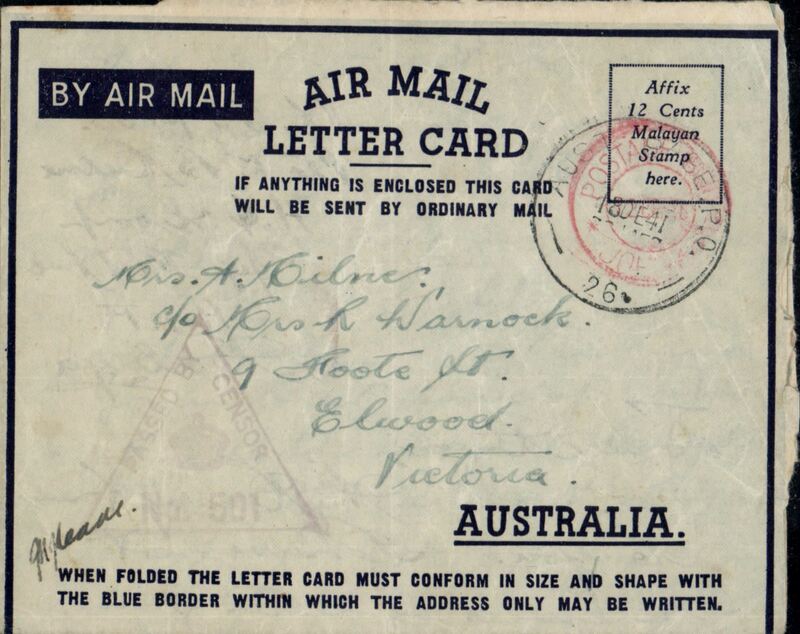 Australian Active Service censored WW II airmail, Malaya to Australia, air letter card franked red 'Postage Paid/12 cents/Johore' double ring hs (shortage of stamps so Postage Paid hs used instead), tied by Australian Base PO No 26/18 De41 cds (based in Jahore/Bahru), violet triangular 'Unit censor No 501'. 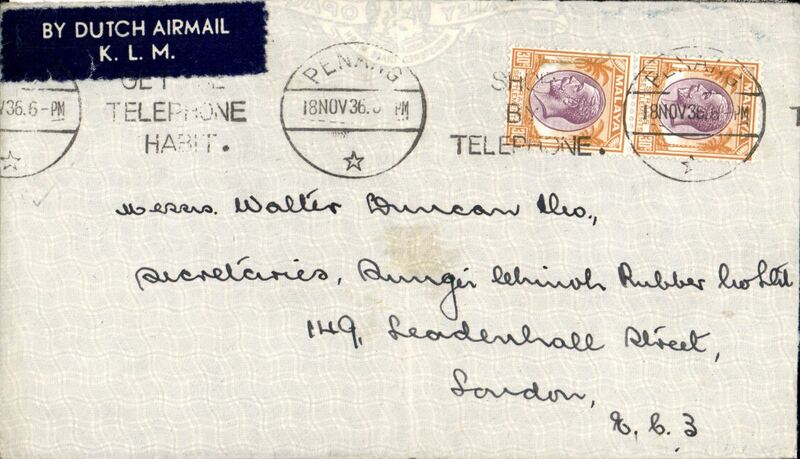 Diamond Jubilee of Sultan of Johor, special Qantas flight, Johor to Sydney, cream/red/blue souvenir cover franked 10c. 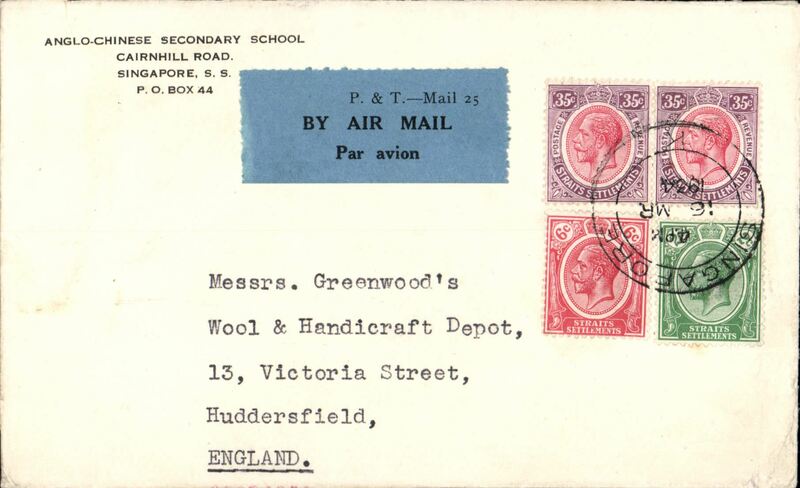 Covers were not back stamped. 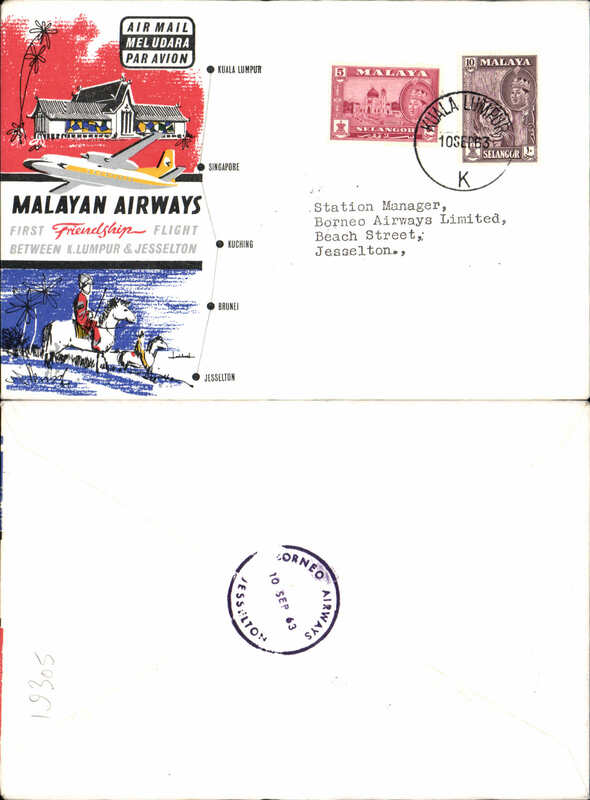 First Friendship Flight, North Borneo to Kutching, bs 10/9, flown Malayan Airways souvenir company cover franked North Borneo 12c. 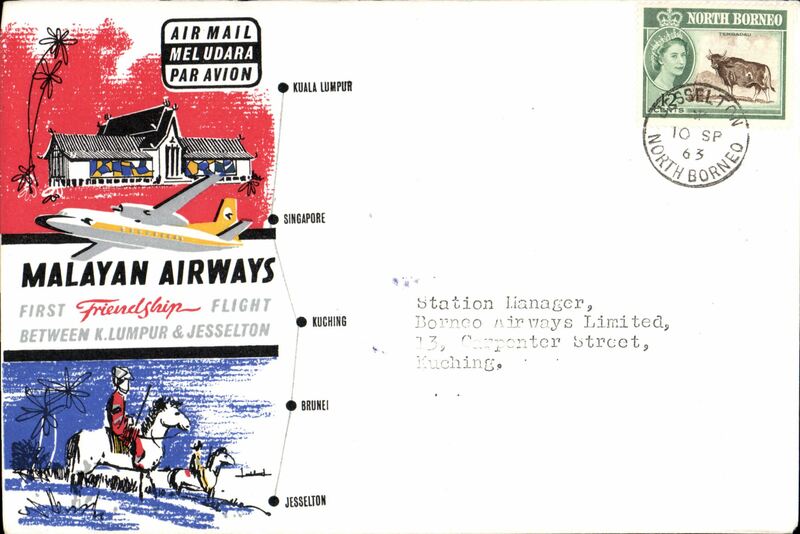 First Friendship Flight, North Borneo to Kuala Lumpur, bs 10/9, flown Malayan Airways souvenir company cover franked North Borneo 20c. 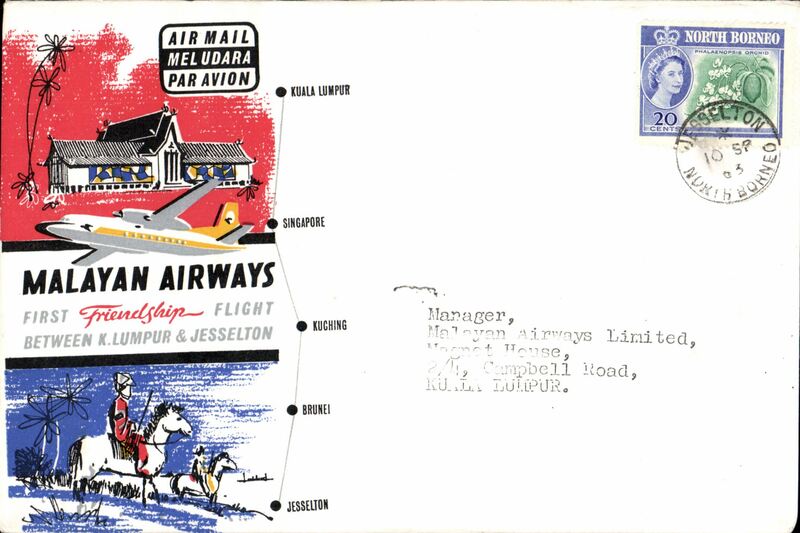 Malaysian Airways, F/F Kuala Lumpur to Jesselton, b/s 10/9, attractive red/blue/black 'map' souvenir cover.